Safe staffing: five years on from the Francis report what has changed? In his 2013 report on care failings at Mid Staffordshire NHS Foundation Trust, Sir Robert Francis QC said inadequate staffing levels were a significant factor in the poor care received by patients at Stafford Hospital. Later that year, Sir Bruce Keogh’s review on hospital deaths in England and the Berwick report on patient safety both found that unsafe staffing levels contributed adversely to clinical outcomes. Five years on, you would hope the lessons learned from these reports would mean the safe staffing picture would look markedly better, but a survey by Nursing Standard and the Sunday Mirror has found that nurses are still struggling to keep their patients safe. Of the 3,100 nurses who responded, 76% said their workplace does not have adequate staff to give patients safe care, and 69% said they do not have time to deliver safe patient care. The results echo a 2017 safe staffing survey by Unison in which 62% of 2,707 nursing staff who responded said staff numbers were inadequate to deliver safe, dignified, compassionate care. Last year’s RCN report Safe and Effective Staffing: the Real Picture offered similar findings. One of the 290 recommendations made in the Francis report was that the National Institute for Health and Care Excellence (NICE) develop guidelines on NHS safe staffing levels. This work was well underway until it was suspended in 2015 and taken over by England’s chief nurse Jane Cummings, who suggested a more holistic approach to staffing rather than focusing on nurse numbers. This resistance by the government in England to mandate nurse-to-patient ratios flies in the face of evidence-based research on safe staffing levels. A 2014 study by nurse researcher Linda Aiken found that patient mortality increased by 7% for every additional patient in a nurse’s average workload. The chief nursing officers for Wales and Scotland have worked with politicians to legislate for safe nurse staffing. The Nurse Staffing Levels (Wales) Act – the first law of its kind in Europe – came into force in April, and a safe staffing bill for Scotland is currently going through parliament. But the government in England has always said it is opposed to mandating safe staffing levels. 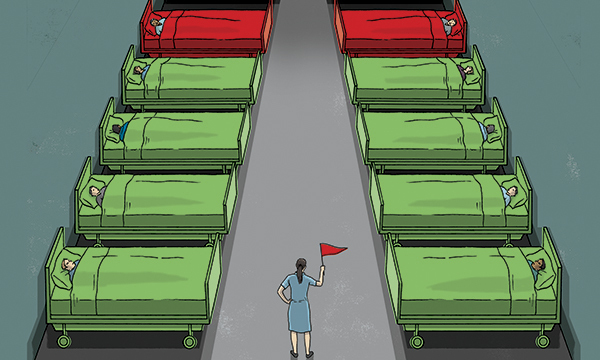 Despite research to the contrary, there is a view that nurse-to-patient ratios could negatively impact quality of care by being too rigid, and that if insufficient registered nurses were available, beds might be closed and patients would suffer. There is also a view among minsters and the nursing community that the staff shortage means not enough nurses would be available even if NHS trusts could afford to hire them. When concerns were expressed about meeting mandated nurse-to-patient ratios in California action was taken to make sure they could be delivered. The ratios came into effect in 1997, when California had a significant nursing shortage. To meet the requirements, a nurse workforce initiative was launched, including a $60 million effort to address this shortage. More than 2,400 new licensed nurses were trained, postgraduate training opportunities were upgraded and a state-wide media recruitment campaign was launched. In December 2000, after intense lobbying by nurses, health officials in the Australian state of Victoria also adopted nurse-to-patient ratios. Training programmes were funded, an advertising campaign initiated and a 12.5% pay increase introduced over three years. By October 2001 an additional 2,650 full-time equivalent nurses had been employed. Evidence shows that until there is legislation on mandatory nurse-to-patient ratios, financial performance will remain a priority over adequate staffing levels, and patient safety will continue to be at risk. Later this year the RCN will launch a campaign calling for legislation on nurse staffing levels across the UK. For the sake of nursing staff and patients, this can’t come soon enough.